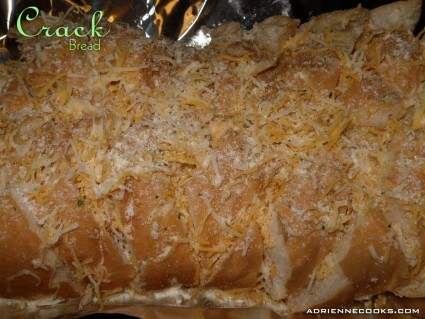 If you have Pinterest, You have no doubt seen this mouthwatering sight: Crack Bread! 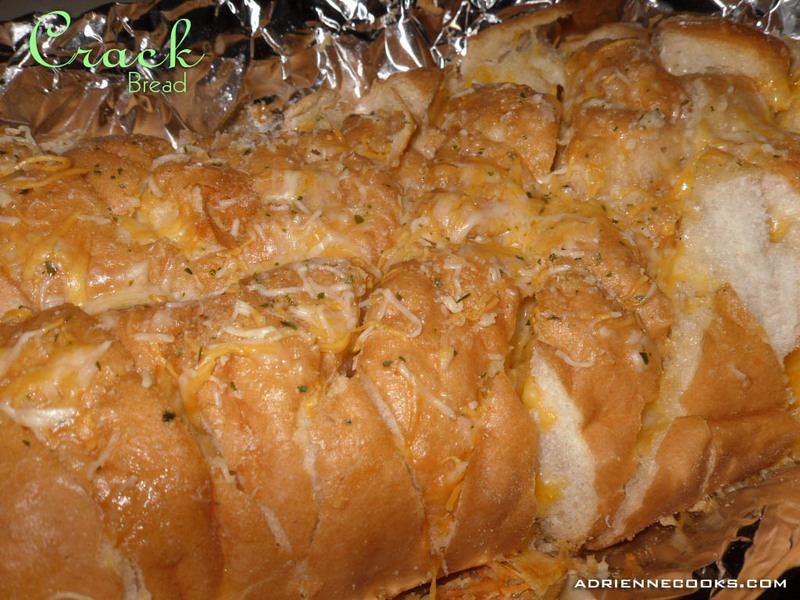 Cheesy stuffed garlic bread. Dear me, who wouldn’t want that?! I looked at 4-5 different permutations of this caloric but oh-so-good monstrosity and came up with the instructions below. Warning: It is VERY good. You will want to make it all the time. DON’T! If you want to fit through you door any way. This is in no way good for you, that’s what makes it a special occasion treat. Now get slicing and stuffing! Preheat the oven to 350 F. Pull out enough foil to wrap your bread in and place it under your loaf. Slice your bread, stopping an inch or so from the bottom in a nice lattice pattern. Make sure to keep the knife perpendicular to the bottom of the bread or you will actually cut out the squares. Melt your butter in the microwave and stir in the fresh garlic. 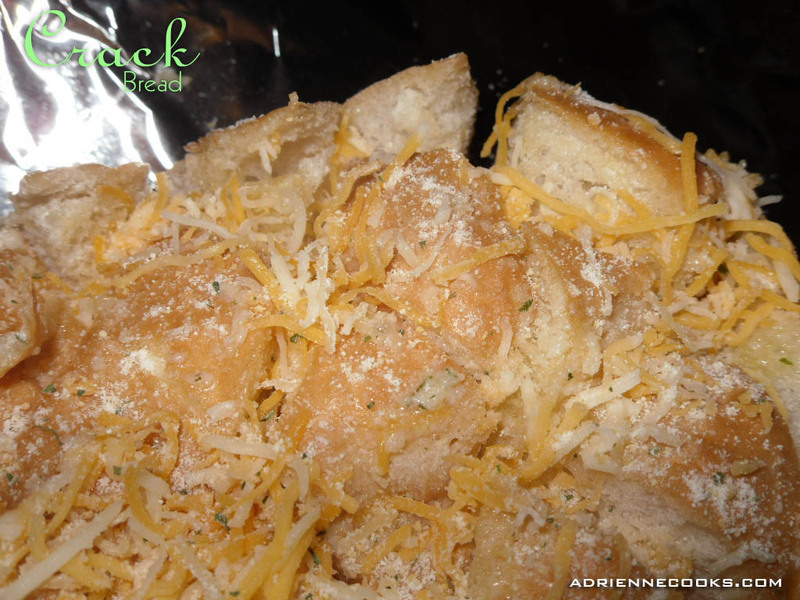 Sprinkle garlic salt over the bread LIGHTLY. You’ll need to sprinkle with one hand and open the cuts with the other. Next, spread again (try to get each section… no one is perfect!) and pour in bits of butter and garlic. Do the same thing again with the cheese. It’s messy. It’s so good it’s worth it though, trust me! Now wrap the stuffed loaf in the foil you have underneath it. Place on a baking tray and bake at 350 degrees for 15-20 minutes. Unwrap – you can either serve at this point or place it back in the oven for 10 minutes to crisp up the top a bit. It’s up to you. Yup. It’s called Crack Bread for a reason! By the by, this goes great with my End Times Rigatoni! Yeahhhh, I would definitely not be able to keep that anywhere in my proximity without devouring it in a few bites! Bread — so delicious. So addictive. Really love your bake! It’s just so amazing!